Founded in 1975 Universal Security Group is an independent security system installer, covering London, the Thames Valley and the Home Counties. We provide a wide range of high quality security systems (Burglar Alarms, Access control & CCTV) and a locksmith service for residential and commercial premises across the south / south east of the UK. We are a certified NSI Gold (NACOSS) installer with considerable knowledge and expertise and are able to design, install and maintain a wide range of security systems to meet your needs. The aim of Universal Security is to provide a quality service for home security and business security systems using only the best equipment installed to the highest standard. Absolute security solutions require a layered approach which Universal Security can provide through their portfolio of security and locksmith services. Burglar alarms, Access Control and CCTV systems once installed need to be regularly maintained to remain effective and we provide a service that allows access to our engineers 24 hours a day, 7 days a week. We also offer a Trade Counter with free parking and a show room, also on show are safes and key cabinets, and our range of reprogrammable Rielda lock cylinders. We also offer a specialist key cutting service. Nationally locks and safes have always been at the core of Universals business; using tried and tested procedures we are able to gain entry without fuss to most locking products. With on going research we are continually improving our abilities as well as adding to our already comprehensive range of physical security products. USG supply all types of locks, mortice, cylinder, re-programmable, padlocks, digital and proximity locks.Universal are stockists of all the major manufacturers of locks and safes, however, we are also very able to deal with the more bespoke or unusual specialist requirements of some of our customers too. Whether master keyed, keyed alike or re-programmable we are expert in setting up security solutions to suit how you run your property. Universal provide the peace of mind that effective physical precautions have been chosen and properly installed. We supply, deliver, install, repair and maintain a range of free standing and under floor safes from the worlds leading manufacturers. Our comprehensive range of safes provides a choice of features and locking options and includes insurance recognised Euro Grade Safes. Also included in this portfolio are: Key Safes, MOT Safes, Deposit Safes, Fire & Data Safes / Cabinets, Counter Safes / Caches, Till Safes, Deed and Cash Boxes. Universal Security Group has been installing INTRUDER ALARM SYSTEMS since its formation in 1975, we design and install bespoke systems of the highest standard to protect property whether a house or a large commercial building. Universal designs the system around the premises, from the initial risk assessment to the commissioning through to the handover we deliver a system that covers all aspects of the use of the building and that is compliant to all the required standards of insurance companies (EN50131-1 amended by PD662:2004) and ACPO (Association of Chief Police Officers: DD243:2004). As an NSI Gold Company (Nacoss) we are able to arrange police response to alarm activations through our Alarm Receiving Centre operated on a 24/7 basis. We are suppliers of all the approved transmission devices such as RedCare Classic, RedCare GSM, Dual Com +, Dual Com GPRS, Emizon and Digital Communicators. Universal Security Group installs commission and maintains FIRE ALARM SYSTEMS to the current British Standards. Many fire protection solutions can be integrated with intruder alarm systems which are monitored through our alarm receiving centres who will alert emergency services or initiate other procedures where necessary. CCTV integrated into desktop computer systemsUniversal Security Group's CCTV camera and recording equipment can provide instant alerts when trouble occurs. The recording and monitoring of incidents / crimes can be invaluable in providing evidence against the perpetrators, making it a vital part of the measures taken to deter and reduce loss through theft and vandalism, or in verifying an alarm activation at an alarm receiving centre. Universal Security Group provide HOLISTIC SOLUTIONS, often when commissioned to carry out an installation of electronic security equipment, flaws in a property's physical measures become apparent, because of this through our security systems & electronic security department we also can deal with LOCK & SAFES issues as well as door services. Through our experience in creating bespoke solutions, Universal Security have designed and patented a variety of door solutions, and of which we are especially proud of our Mod. III door. At the heart of the Mod. III is the steel wrap around chassis, welded to this chassis there are two lengths of square box section which houses the solid steel locking bolts. Having the steel bolts within in continuous fixed housing provides maximum strength against attack. To compliment the security even further, we install a full length “U shape" security hinge. This hinge has been designed to “wrap around" the door and offer an incredibly high level of resistance against force to the hinge side of the door. Through our day to day dealings with doors, door hardware including hinges, closers, and door furniture our experience helps provide a reactive maintenance service that is comprehensive and efficient. 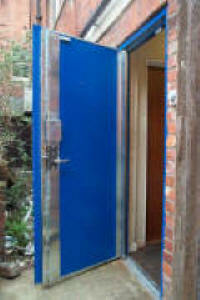 USG can supply and fit the full range of emergency exit equipement. Our door services cover emergency doors and panic hardware, Universal Security Group keeps fully up-to-date with all the regulations including those that cover fire exit doors and those that cover free access in the disability discrimination act (DDA). Universal manufacture, install and service all types of doors internal and external, steel, timber and aluminium construction. As well as doors our service can include the whole shop front whether to bring the aesthetics up to date or to accommodate automatic sliding doors. Universal install and maintain all types of automatic door sliding and swing, we are also able to automate existing swing doors by using automated door arms. As with all areas of our services we offer a 24 hour reactive maintenance service. Universal install and maintain most types of roller shutter including sprung or motorised, we can provide a wide selection of lath patterns in steel or aluminium and colour coded if required. With our years of experience in securing and maintaining the doors and fronts of retail properties Universal are proud of the quality and level of service they provide, and their ability produce to solutions that match the differing demands of a wide variety of clients. Controlling and restricting access to certain areas of an institution or business is often a vital part of that entity's security. Whether access is authorised via an audio-visual entry system on a perimeter door or a technology authorised unit into a staff only area using a pin number, card or even the scan of a thumb print, access restriction systems give front end security and control throughout the building 24 hours a day. Our Access Control solutions include; electronic and digital keypads, swipe card, proximity, fingerprint identity and audited systems. Since 1975, Universal Security Group have been involved in delivering access control solutions, from single door applications to integrated networkable multi door systems across a wide variety of clients and requirements. We listen to and deliver the solution which suits how the building is used and delivers the levels of access and restriction required. We also supply fit and connect the locking solutions for these systems; again we supply those options that suit the application because we are not restricted by the ability to only deliver expertise in control equipment and readers. We supply and fit the locking hardware too, whether electro magnets, electronic door releases or motorized / solenoid electric locks. In short USG supply the end to end Access Control Solution. The Mod. III has been designed to provide maximum security whilst still retaining the qualities of an external exit. At the heart of the Mod. III is the steel “wrap around" chassis. Welded to this chassis there are two lengths of square box section which houses the solid steel locking bolts. Having the steel bolts within in continuous fixed housing provides maximum strength against attack. To compliment the security even further, we install a full length “U shape" security hinge. This hinge has been designed to “wraparound" the door and offer an incredibly high level of resistance against force to the hinge side of the door. The wrap around chassis and hinge have been constructed to slide over the timber core, but they allow just enough space to insert a “sheet of steel" to external face of the door. This sheet fits behind both “wrap around" areas. The frame is also clad with steel plate for additional strength and is secured to the brickwork using 150mm bolt fixings.